This villa is great for two families or several couples to share. Each suite is set up like its own retreat, and there’s more than enough bikes, paddle boards, and kayaks to go around. There’s a living area and kitchen for every two suites, and everything is spread out across two levels. Beautiful villa for couples or families traveling together! 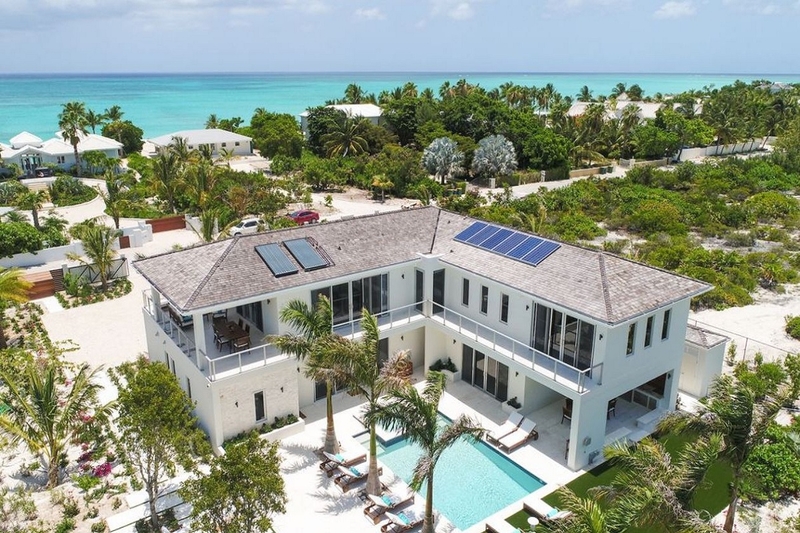 Villa Viatu sits on the eastern tip of Providenciales. Viatu is Swhalli for “sandals or barefoot,” and its proximity to the beach is perfect for barefoot living. This property takes advantage of its tropical surroundings: palm trees provide shade around the pool and solar panels on the roof provide power. Pelican Beach is a minute from Viatu’s back door, with Leeward to the right and Grace Bay to the left. The villa provides six bicycles, a beach wagon, two kayaks, two paddle boards, and snorkel gear for seaside fun. There’s also a beach umbrella, towels, and toys that can be set up by the pool/beach attendant. Back at the villa, there’s a private pool and spa tub to relax in. Sunbathe in the plush sun loungers, rinse off in the al fresco rain shower, and snooze in one of the two hammocks. At night, enjoy drinks around the fire pit as the sun sets, or enjoy dinner on the pool level or balcony. The villa is staffed by a housekeeper, gardener, and pool man. Full speed internet and WiFi runs throughout both levels. There’s three bedrooms, two living areas, and one full kitchen on the pool level. The Kutulia Junior Suite has a queen bed and an ensuite bathroom with a rain shower. It’s lounge area has a TV, docking station, kitchenette, dining area, and a mini bar. This suite opens to the pool and gardens. The Bahari Suite has a king bedroom and a queen bedroom, and both have an ensuite bathroom with a rain shower. The king bedroom has a private entrance from the driveway and the queen bedroom has a private entrance from the pool deck. Both rooms share a lounge area with a TV, a dining table, and a full kitchen with an island and stainless steel appliances. Upstairs, there’s three bedrooms, two living areas, and one full kitchen. The Amani Grande Luxe Oceanview Suite has its own lounge with a TV, a dining table, a full kitchen, and access to the dining/living area on the balcony. There are two bedrooms in the Amani Suite: one has a king bed and balcony, and the other has a queen. Both have ensuite bathrooms with rain showers. The Kiangazi Junior Deluxe Studio Suite also has its own balcony, a lounge with a TV, a kitchenette, a mini bar, and a dining table. It’s bed is king-sized, and the ensuite bathroom has a rain shower. All six bedrooms have a SmartTV, surround sound and bluetooth speakers, air-conditioning, Egyptian combed white linen, bedside clock radios, and privacy shades. The property is within an easy walk to the white sandy shores of Pelican Beach and a short drive from Grace Bay and Leeward. There’s tons of activities nearby in Blue Haven Marina, from boat charters to snorkeling tours. Rates do not include: tax of 12%, island charges of $500, island charges of 10%. There is a 2-3 minute walk to Pelican Beach from the villa. Upon arrival guests will secure a rental car and use the directions provided to drive to the villa to meet with a member of the villa management team.